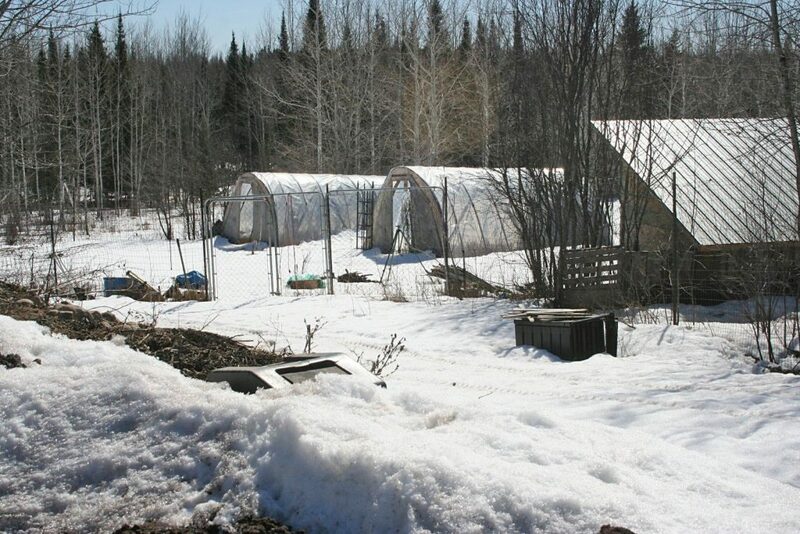 Our garden is still snow-covered but the hoop houses are standing. I’ve been watching the snow-covered garden, just waiting for the day I can actually walk on the dirt. Fortunately, our hoop houses made it through the winter with no damage from the very heavy snow on them — we were worried. I’ve been transplanting the first of our peppers. Despite me frying them by leaving plastic on in a sunny window (it was cloudy! ), most have recovered nicely. The ones that died were re-planted and are just now coming up. I can’t get over how fast our tomatoes are growing. I’ll be transplanting the first flat of them this week. 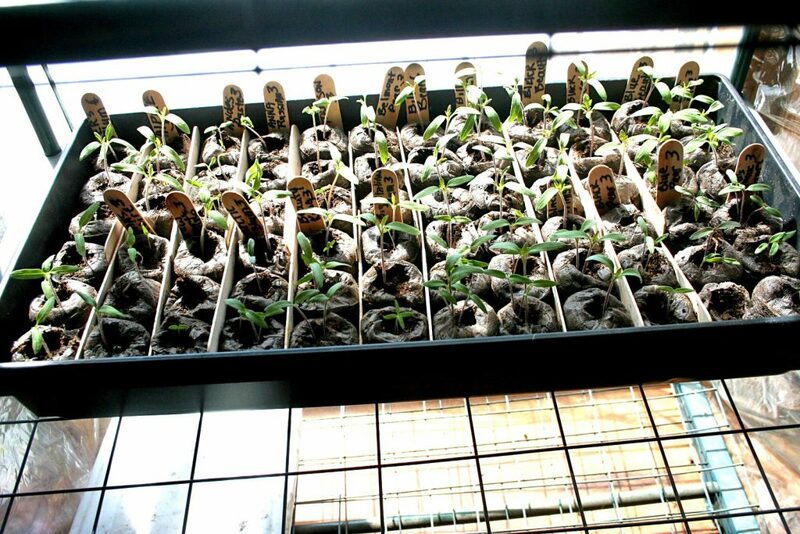 Here are the first of our transplanted pepper babies, all snug in their coffee cups. (I’ve recycled these cups for years and years; some bear seven name labels! We’re going to plant some tomatoes and peppers in the Sand Garden and North Garden this year, sort of as an experiment and “overflow” from the main garden, where they are usually planted. We’ll put hot peppers in one hoop house, sweet peppers in the other, and the “overflow” in assorted plots here and there. I can’t wait! The tomato seedlings are nearly ready to transplant. Doesn’t that dissolve the cup? I’ll give it a try although it’s pretty easy to just cross off the old names…. I do hundreds. Hey Kevin, I tried your tip. The good news is that the rubbing alcohol doesn’t dissolve the cup. The bad news is the alcohol didn’t touch the permanent marker’s writing on the Styrofoam cups. The crains are migrating. You can hear them at night, flying high and fast dodging the small storms that keep coming our way. Cool! We have had a pair of Sandhill Cranes nesting on our creek bottom for several years now. I can’t wait to hear them come home! Hi Jackie! I look forward to your blog every week! Love reading about your experiences. 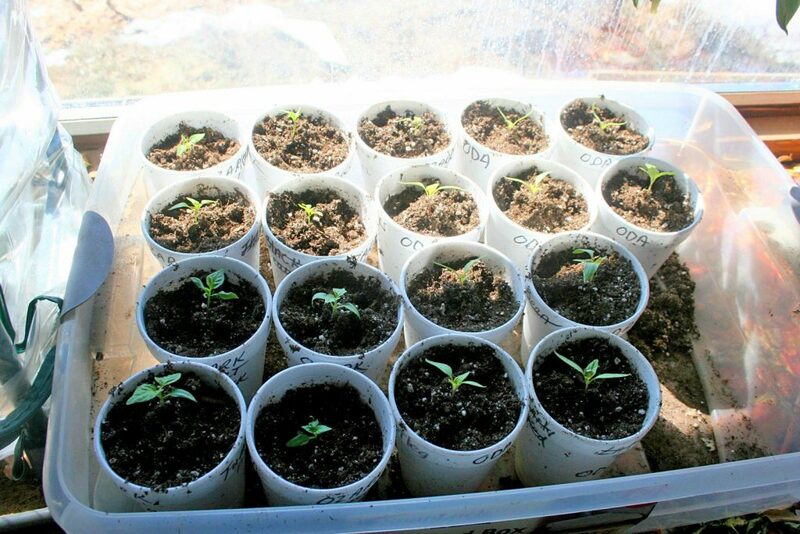 How do you decide when the tomatoes are ready for transplant? Thanks! Thanks Angie! I usually transplant my tomatoes when they have two sets of leaves; their “baby” leaves and the first set of true leaves which are notched. Yes, we have lots of birds out,robins,cardinals,geese, giving us hope spring WILL get here soon! Lol! Ah! That’s so great. We had a pair of Canadian geese flying up the creek and landing on the puddles on the ice of our small beaver pond. I’m WATCHING for everyone else.